Let me introduce you to someone. His name is Mr. Sweet Potato. You may have met him before, you may have even enjoyed his company, but you might have thought he was too unexciting to go out of your way to see again. You might have also found him just a little too sweet for his own good, with that appearance he made cloaked in sugar, marshmallows or pie crust at your last family get-together and his uncanny ability to make your grandmother swoon. You probably decided he had friend potential, maybe someone you would invite for holidays at your house to amuse your relatives, but you decided he just wasn’t your kind of potato for anything more. Well, let me tell you something. Times have changed. Since you last met Mr. Sweet Potato, he has matured. He has roughed-up that sugary veneer and cast off those wretched marshmallows. When you meet him now he exudes the unmistakable scent of earth, and spice, and danger; even his clothes are different: rough, torn, masculine. He has been to exotic places, learned things that will thrill you, amaze you, make you crave his company in a way you never thought possible. After you’ve been with him, you dream about him at night, imagining how your next encounter will be even more exciting than the last. Your grandmother may not even like him anymore. But this bad-boy potato hasn’t completely transformed. Underneath this new facade is still that same sweet wholesomeness you admired in him before. Despite the fun, the impetuousness and the danger this is a potato that once welcomed into your life will care for you, nurture you, nourish you. He’s still good for you – he’s just a lot more fun than he used to be. Shall I give you his number? something cool and creamy to dollop on top: sour cream, yogurt, tzaziki… even hummus! While the potatoes are roasting, make the salad. I like to toast the cumin and coriander seeds before using them, but you don’t have to. If you do, just heat them in a dry pan, stirring often, until they smell fragrant and toasty. Set aside to cool, then crush them coarsely in a mortar or with the back of a heavy knife (if using whole seeds). Mix together all the salad ingredients in a bowl and leave to marinate in the fridge until the potatoes are done (add a little more olive oil if it seems dry). When they are, remove them from the oven and place on plates. Slice them lengthwise down the center, folding open to reveal the orange flesh inside. Sprinkle with a little salt and pepper. Pile half the feta salad on each potato, and eat! Notes: I can’t get enough of this dish. The contrasts between hot and cold, sweet and salty, crunchy and soft are mind-blowing. I make it in a slightly different way every time, depending on what I have in the fridge, but it graces our plates at least once a week. 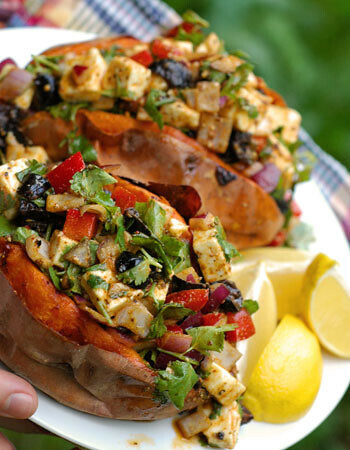 It is so simple, so quick, and so delicious – I am head over heels in love with sweet potatoes. I am well aquainted with Mr. Sweetpotato but now I may have another way to dress him up/down for the evening. What a lovely post (and picture). I have some catching up to do on your blog… dodgy Wifi makes for challenging work & play. He sounds hot. I’ll take his number 🙂 Though I’ve never had sweet potatoes with marshmallows, I am a huge fan of mashed sweet potatoes bruleed with brown sugar. And yes, when you call it bruleed it sounds that much better, doesnt it? Great post, you have me longing for my own hot potato! Hi Melissa – I’ve just got back from holiday so I’ve had some catching up to do on your posts. Just ran out and got the ingredients for this recipe so I’ll be trying it tonight. I’ve also got your honey and ricotta ice cream in the freezer. Yum!Loved your post on mangoes too. Every June I spend as much time as I can stuffing my face with alphonso mangoes. I like making lassi with them but I’ll definitely try your recipe for frozan yoghurt. Hi Melissa,Your “romantic” vision is not too far off… More than once we’ve parked the vehicle in an odd angle (even on the sidewalk) in the dead of night to “borrow” WiFi. We find signals via our Boingo finder, another service (I forget which one) and of course by clicking on our signal finder and sometimes tapping in to a network. Currently we’re in a B&B in Austin which has its own so for a few short days I’m happy surfer. This sounds delicious. By the way sweet potataoes are called Rathaloo in Maharashtra, India and are used frequently in simple veggie dishes.Your blog is inspiring….makes one want to try out the recipes right away and the pictures absolutely drool worthy. Hi Heather – Well, “borrowing” a little wifi never hurt anyone, now did it? I’m sure the providers would agree, if they knew what a good cause it was being “borrowed” for! Hi Deccanheffalump – That’s quite a name! 🙂 I’m glad to know that sweet potatoes are enjoyed in India – I don’t think I’ve ever run across an Indian dish containing them here, so maybe I’ll consult my cookbooks for a recipe. Thanks for your compliments on the blog – I really enjoy reading yours too! I have a recipe for Sri Lankan sweet potato curry I can send you if you like. It’s from a Madhur Jaffery book, but I have to say I’ve never had anything like it at home or at any Sri Lankan person’s house. Btw, the baked sweet potatoes turned out really well. Ben says he is extremely grateful to you for putting on your blog! Hi Rowena – so glad it worked out for you! I’m also really glad to have made this culinary discovery – it will certainly be at the top of my list whenever I see it on the menu. Hi Shauna – Sweet potatoes are actually very forgiving, as you must have realized. I often stick them in the oven and forget them there for hours – but they’ve never complained! Your ozzie pizza sounds absolutely delicious. Must file away for a rainy-day pizza emergency…Hi Melissa – What a nice name you’ve got there 😉 You’re lucky to have a source for sweet potatoes, as I’ve found them to be hard to track down in some corners of Europe. Then again, what can’t you find in France? This recipe sounds awesome. I’m definitely going to try it out.I generally like my sweet potatoes very simply roasted – chop them in slices or wedges, toss in some olive oil, kosher salt, black pepper, and some rosemary. Throw them in the oven for a while until they start browning. Very easy side dish for just about anything! And sweet potatoes are a lot better for you than regular potatoes — high fiber, vitamin B, and various other nutrients. Good stuff. Hi Adam – That sounds like an excellent way to prepare them too! You know, I’ve always liked sweet potatoes better than normal potatoes, so it’s particularly nice to learn that they’re so healthy. If only taste and nutrition always went hand in hand! Hi Shauna! I’m sooOOOoooOooooooOOOOoo glad you liked them! Hi Yam Fan – I’ve never understood either how the poor sweet potato came to be so maligned. They’re so much better when treated as a vegetable! Your recipe for mashing them sounds delicious – I’ll definitely have to try it. I do have Dharshi’s curry recipe – why don’t you send me an email (my address is on the ‘about’ page) and I’ll email it back to you? I kind of cheated. I just put some tomatoes, olives and feta in a baked sweet potato. Delicious! Thanks for the idea. I loved the salty-sweet combo. Hi Jessica – Hey, whatever works! 🙂 I also vary this recipe quite often, it makes a good foundation for improvisation. Hi Melissa!I’ve been enjoying your wonderful blog for a while now, as much for beautiful photos as for your posts – I just love your writing! I also like how almost every story is built around an interesting recipe, and every recipe has a lovely story behing it. But this – this is a masterpiece! And the recipe is great, I tryed it, and – not surprisingly – loved it, and I agree with every word you say about it! A good surprise for me was that my husband also loved it. I’m always so happy when he approves the recipes I fish from the internet – it justifies the enormous amount of time I spend on this hobby of mine. So thank you, thank you, thak you! And keep it up! :)PS The only disappointment for me was that I just couldn’t convey all the charm of your story to my husband. English is not our mother tongue (which is Russian) and his is not as good to let him easily enjoy text of this sort. But I did my best! Hi Yulia! I’m always so thrilled to hear that one of my favorite recipes has met with approval, and of course I’m glad it’s helped to justify your time spent reading foodblogs to your husband 🙂 So thank you for taking the time to give me feedback on the dish, and thank you as well for all your kind words. I hope you and your husband will find many more recipes here to whet your appetites! Hi again, Melissa!Would you mind if I shared this recipe on a Russian cooking forum and included your picture of it? With a note that it’s yours and a link to your post, of course. In spite of having made this dish four times already, I just didn’t have a chance to make a decent picture, but posting it without an illustration wouldn’t give it the deserved attention.What is it baout great recipes that gives you this strong urge to share it with as many people as possible? 😉 Anyway, I’ll be waiting for your answer. Mmmmmm…. I just made this recipe and it was fabulous! Very very strong flavors contrasting with the mellow sweet potato. I was worried about the raw onion and garlic so I sauteed them first, but then decided this was one recipe in which raw onion would not overpower the rest, so I added some after all (not red onion, the really sharp stuff). It was very very very good. This is my first attempt at making one of your recipes and certainly an encouraging beginning. Now, if I can only muster up the courage to try your pastilla…One question: I’d love to show this salad off to guests, but I’m afraid not everyone may be a fan of such strong flavors. Have you tried it on many guests? Do you get some polite "mmm, how interesting?" comments? Or only raves? Hello Melissa,Thanks for a delicious, beautifully presented, dish! I’ve shared your recipe with several friends who are fellow lovers of sweet potatoes. A page at my site http://www.All-About-Sweet-Potatoes.com/marshmallows-sweet-potatoes.html addresses the tradition of putting "those little white lumps" on or in sweet potatoes. I hope you and/or your readers find the page, and site, helpful. I love your description of Mr Sweet Potato. Sounds like it would be worth making a date with him in his new guise.